Another pudding that I thought I would make for Dan and I, this looked pretty similar to the hot chocolate pudding, but was actually quite a different thing to bake – although still not terribly complex. You start by placing cranberries and chopped up cooking apple in the base of a pudding bowl. You then mix together butter, dark brown sugar, eggs, flour and cocoa powder and pour this over the fruits. You then steam the whole thing for at least an hour (the recipe claimed an hour – it took closer to two on my hob, which was a little frustrating). Finally, once the pudding is ready, you make a chocolate sauce to cover it; the sauce is simply double cream and chocolate with vanilla and almond essence mixed it. Overall, a pretty tasty chocolate sponge, and great if you want some added fruit. But still not Nigella’s chocolate pudding for Christmas pudding haters with hot chocolate sauce. This is another recipe that I made for Dan and I in the run-up to Christmas. Whilst I have been doing a lot of Christmas baking, I didn’t want Dan and I to end up with no tasty treats whilst this was going on. I fear it might have had the opposite effect and I’ve been baking a little too much… but we’ve ended up with some tasty treats because of it! Another thing I’m afraid I don’t have a photo of, possibly because we were both far too desperate to eat the chocolate pudding the minute it appeared! Again, it’s not a difficult pudding to make. You melt some chocolate, add eggs and sugar, then fold in some flour. It then takes approx. 10 minutes to bake in the oven; the whole thing only takes half an hour or so to put together, and tastes pretty good. There’s nothing particularly spectacular about it, but if you want a chocolate hit, you could do worse. Of course, if you want a really big chocolate hit, you should be making Nigella’s chocolate pudding for Christmas pudding haters with hot chocolate sauce. 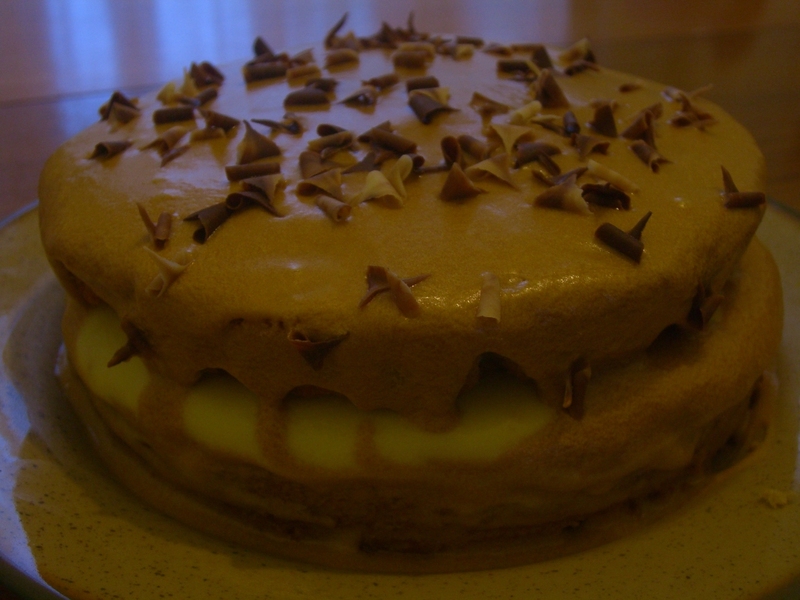 Coffee cake with coffee buttercream dripping over the side. You just keep pouring until it no longer stays on the cake, then its OK to stop. This is a basic “Victoria Sponge Sandwich” recipe, with coffee granules melted into the mixture and coffee added to the buttercream. I suppose that “technically” it is a sandwich, since we’ve pressed two baked goods together with a filling in between. Still, would you be willing to replace the buttercream with some tomatoes and lettuce? Because I wouldn’t. We made this cake because a friend, who we will go by the pseudonym of “Mr A”, invited us over for dinner and then added that we might not be not getting in without either coffee cake or carrot cake. Having everything needed to make coffee cake in our first aid kit, we whipped this fellow up. 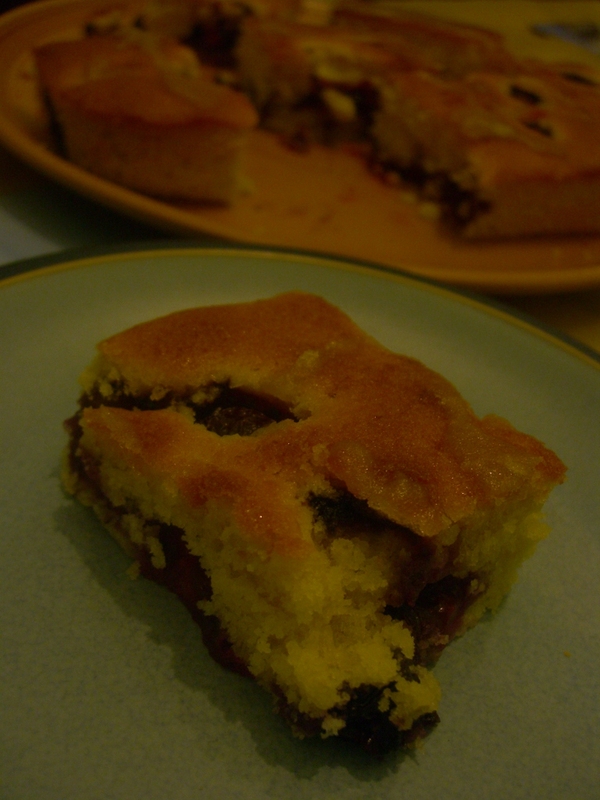 It was not bad for an emergency cake – perhaps a little heavy which can be good or bad depending on preferences. Anyone can make coffee cake but only “Mr A” can eat the whole thing in a day: it was gone 24 hours later. We did however get fed, and rather well with a yummy Stuffed Mushroom (I think this recipe) for the veggies and steak for the meaties, so I think we came out even! Recipe: Mary Berry’s Ultimate Cake Book, page 195. I can’t recommend this cake strongly enough. It is enough to turn even the most staunch chocolate lover. The wicked witch would get a lot more takers if she was peddling this stuff. But she would no longer be wicked, she would be loved as the queen of all things beautiful. I guess there isn’t anything too special about the ingredients of this. Its simple, right? A nice fluffy sponge, a lot of blueberries, and some lemon drizzle. What is there to say? That is all you can say when you’ve had a bite of this traybake. Somehow, it just works amazingly well together. It helps that golden caster sugar is used instead of white. It helps that the lemon flavouring is very, very intense. It really helps that the drizzle is golden lemon flavoured. It helps that the blueberries don’t all sink because a portion are dropped on top rather than mixed in (a great tip, by the way). It helps that I gobbled nearly all of it on the day it was baked, although to be fair that was a compulsion rather than a strategy. I just really like this cake. Recipe: “The daily cook book” by Love Food, June 19th.